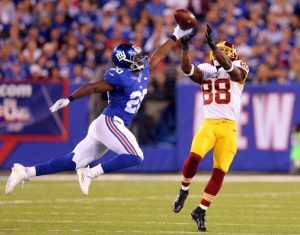 The New York Giants may have saved their season with a convincing 32-21 victory over the Washington Redskins at MetLife Stadium on Thursday night. The Giants improved their overall record to 1-2 while the Redskins fell to 1-2. The Redskins received the football to start the game but could not pick up a first down. After offsetting penalties negated the first punt, the second punt attempt by Washington was blocked by running back Rashad Jennings for a safety. New York was up quickly 2-0. The Giants crossed midfield on their first offensive possession but were forced to punt. On the second snap of Washington’s second drive, cornerback Prince Amukamara picked off quarterback Kirk Cousins at the Redskins 20-yard line and returned it to the 14. Four plays later, running back Andre Williams scored from one yard out to make the game 9-0. The Redskins went three-and-out on their third possession. The Giants responded with an 8-play, 47-yard drive that set up a 35-yard field goal by place kicker Josh Brown as the Giants expanded their lead to 12-0. The Redskins then finally moved the ball on their fourth possession, putting together a 10-play, 54-yard effort that resulted in a 44-yard field goal. 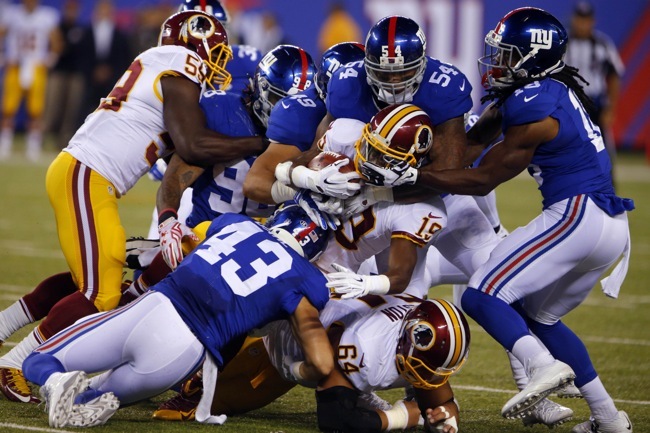 Giants 12 – Redskins 3. Both teams then exchanged field goal drives again, the first a 9-play, 47-yard possession by the Giants that resulted in a 36-yard field goal by Brown and then a 13-play, 61-yard possession by the Redskins that resulted in a 37-yard field goal. The Giants once again crossed midfield on their final possession of the first half but could not score. At halftime, the Giants led 15-6. 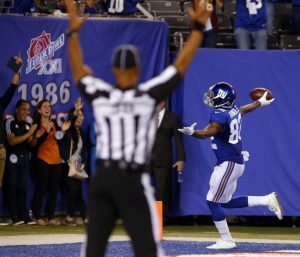 The Giants received the football to start the second half and promptly expanded their lead to 18-6 after a 15-play, 50-yard drive that took up half the third quarter. The Redskins responded with a scoring threat of their own that was dramatically stopped when linebacker Devon Kennard deflected a pass by Cousins that was intercepted by fellow linebacker Uani’ Unga at the New York 27-yard line. The Giants then took charge of the game with an 8-play, 73-yard drive that ended with a 30-yard touchdown strike from quarterback Eli Manning to wide receiver Odell Beckham. The Giants led 25-6 early in the fourth quarter. The Redskins looked to make things interesting on their ensuing possession by driving deep into Giants territory. On 4th-and-1 from the Giants 7-yard line, running back Matt Jones picked up the first down but fumbled the ball out of bounds in the end zone, resulting in a touchback and a turnover. The Giants went three-and-out on the following possession. Washington then drove 74 yards in 12 plays to cut the score to 25-14 after a 4-yard touchdown pass and a successful 2-point conversion attempt with 3:40 to play. Running back Shane Vereen recovered a Redskins onside kick attempt at the Washington 41-yard line. Three plays later, on 3rd-and-10, Manning hit wide receiver Rueben Randle for a 41-yard touchdown to give the Giants a 32-14 advantage with 3:21 to play. However, the Redskins returned the ensuing kickoff 101 yards for a touchdown. The second Redskins onside kick went out of bounds. After a three-and-out by the Giants, the Redskins received the ball with 1:43 to play and advanced the ball to the Giants 14-yard line before the clock expired. Offensively, the Giants gained 19 first downs and 363 total net yards (279 passing, 84 rushing). The team was only 4-of-12 on third down (33 percent). Manning completed 23-of-32 passes for 279 yards, 2 touchdowns, and 0 interceptions for a QB rating of 119.1. His leading receivers were Randle (7 catches for 116 yards and a touchdown) and Beckham (7 catches for 79 yards and a touchdown). Jennings gained 31 yards on 11 carries, Williams 29 yards on 14 carries, and Vereen 23 yards on six carries. Video highlights/lowlights and the post-game locker room celebration are available at Giants.com. Running back Orleans Darkwa left the game with a knee injury and did not return. Cornerback Prince Amukamara hurt his ankle but returned to the football game. Inactive for the Giants were WR Victor Cruz (calf), TE Jerome Cunningham (knee), DE Robert Ayers (hamstring), DT Markus Kuhn (knee), DE Owamagbe Odighizuwa (foot), RT Ereck Flowers (ankle), and CB Dominique Rodgers-Cromartie (concussion). The Giants have won five games in a row over the Redskins. For the second time in three games, the Giants did not commit a turnover. QB Eli Manning increased his career touchdown pass total to 263. That broke a tie with Dave Krieg and moved Manning into 12th place on the NFL’s career list. Joe Montana is 11th with 273. Justin Pugh made his first career start at left tackle. John Jerry started at left guard. Middle linebacker Jon Beason made his 2015 debut after missing the first two games with a knee injury. Beason split time with Uani’ Unga, who led the Giants with nine tackles (six solo). Jayron Holsey started at left cornerback for Rodgers-Cromartie. Fullback Nikita Whitlock played several snaps at defensive tackle in the fourth quarter, as he did in the preseason finale in New England. 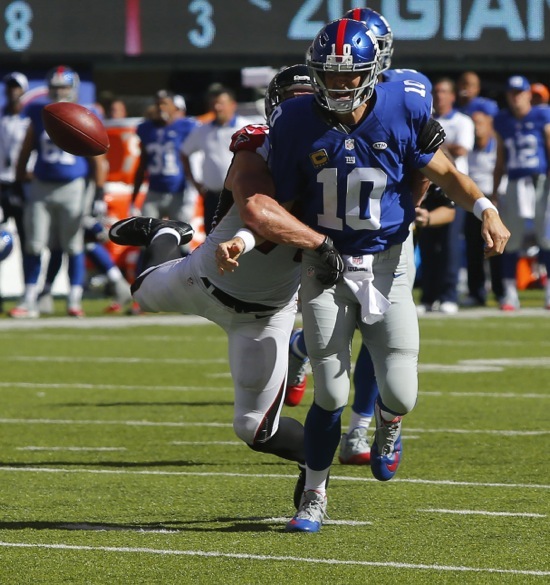 The New York Giants squandered another 10-point fourth-quarter lead and fell to the Atlanta Falcons 24-20 at MetLife Stadium on Sunday afternoon. With the loss, the Giants fell to 0-2. It’s the first time in team history that the Giants have started three seasons in a row 0-2. It is also the first time in NFL history that a team has lost its first two games after leading by 10 points or more in the fourth quarter. The Giants have lost their last four home openers. Each team moved the football to start the game but was forced to punt. The Falcons then went up 7-0 after a 13-play, 86-yard drive that ended with a 1-yard touchdown run near the end of the first quarter. The Giants responded with a 10-play, 45-yard drive early in the second quarter that resulted in a 38-yard field goal by Josh Brown. Falcons 7 – Giants 3. The Falcons immediately followed that field goal drive with one of their own as Atlanta went 56 yards in 11 plays to set up a 42-yard effort. The Giants quickly tied the game on a short slant pass from quarterback Eli Manning to wide out Odell Beckham who turned on the burners en route to a 67-yard touchdown play. The game was tied 10-10. Neither team was able to move the football for the rest of the half until the Giants last possession before intermission. The Giants drove the ball 30 yards in six plays to set up a 44-yard field goal that gave New York the lead at halftime 13-10. The Giants received the opening kickoff of the second half and moved the ball 69 yards in nine plays to go up 20-10. The big play on the drive was a 37-yard pass to running back Shane Vereen on 3rd-and-5. Three plays later, Manning hit tight end Larry Donnell for a 10-yard score on 3rd-and-4. The Giants defense forced a three-and-out and the Giants offense then let a golden opportunity to put the Falcons away slip through their fingers. After a 35-yard run by running back Andre Williams and a 12-yard run by Vereen on 3rd-and-7, the Giants were able to drive deep into Atlanta territory. But on 3rd-and-2 from the 8-yard line, Manning was sacked and fumbled the ball away to the Falcons. Instead of being up 27-10 or 23-10, the score remained 20-10. Worse for New York, after this mistake with less than five minutes left in the 3rd quarter, the Giants offense basically shut down for the remainder of the game. The Falcons immediately took advantage by driving 91 yards in 12 plays to cut the Giants lead to 20-17 with under 13 minutes to play. The 10-yard touchdown pass to wideout Leonard Hankerson came on 3rd-and-9. The Giants did reach the Falcons 38-yard line on the ensuing drive but running back Rashad Jennings’ 3rd-and-2 run was stuffed for a loss and the Giants punted. The Giants defense held after giving up a couple of first downs and the Giants received the ball back with 4:24 to play. But New York could not pick up one first down and was forced to punt. Worse, on this series, the Giants were called for delay of game after an Atlanta timeout. The Falcons then quickly drove 70 yards in seven plays for the game-winning touchdown with 1:14 left to play. The Giants had a glimmer of hope after a 30-yard defensive pass interference penalty against Beckham gave them the ball at midfield with 1:02 to play. But the game ended after four straight Manning incompletions, including two drops by tight end Larry Donnell and wide receiver Preston Parker. Offensively, the Giants accrued 19 first downs and 388 total net yards (97 rushing, 291 passing). The Giants were 10-of-17 (59 percent) on 3rd down conversions. Manning finished 27-of-40 for 292 yards, 2 touchdowns, and no interceptions. But his fumble on the goal line was very costly. Beckham caught seven passes for 146 yards and a touchdown while Vereen caught eight passes for 76 yards. Williams was the leading rusher with six rushes for 43 yards. Jennings was limited to 12 yards on nine carries. Defensively, the Giants allowed 25 first downs and 402 total net yards (56 rushing, 346 passing). The Falcons were 11-of-17 (65 percent) on 3rd down conversions. New York did not force a turnover. Defensive end Robert Ayers and defensive tackle Cullen Jenkins each had sacks and the Giants were credited with eight quarterback hits. Inactive for the Giants were WR Victor Cruz (calf), TE Daniel Fells (foot), LB Jon Beason (knee), DT Markus Kuhn (knee), DE Owamagbe Odighizuwa (foot), S Cooper Taylor, and OT Bobby Hart. QB Eli Manning increased his career passing yards total to 40,240, which moved him one yard in front of Johnny Unitas (40,239) and into 14th place on the NFL’s career list. Manning is the 15th player in history to pass for at least 40,000 yards. WR Odell Beckham increased his career reception total to 103, which is an NFL record for the first 16 games (a full season) in a career. Beckham set the mark in only 14 games. It was the fifth time in his last six games dating back to last season that Beckham totaled at least 130 receiving yards. 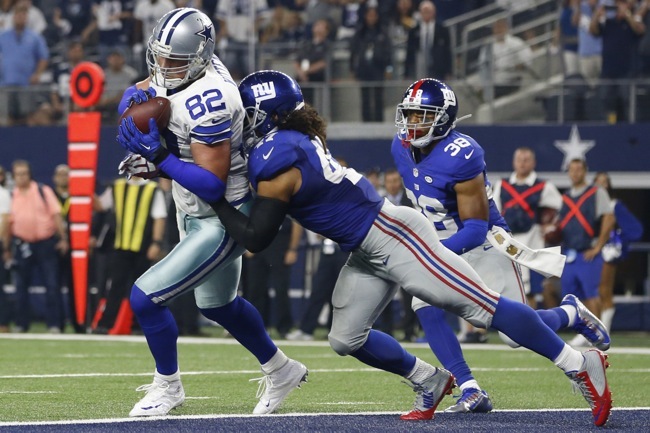 The New York Giants had the Dallas Cowboys on the ropes but they let the game slip away in the final seconds as Dallas quarterback Tony Romo hit tight end Jason Witten for an 11-yard touchdown with seven seconds in the game to win 27-26. The touchdown catch culminated a far-too-easy 6-play, 72-yard drive in 87 seconds. Making matters worse was the Giants had a chance to put the game away before the drive. Leading 23-20, the Giants had successfully driven from their own 20-yard line to the Dallas 4-yard line with 1:54 to play. After two runs by running back Rashad Jennings had picked up three yards and caused the Cowboys to spend their last timeouts, the Giants faced 3rd-and-goal from the 1-yard line. The Giants chose not to run the ball. Quarterback Eli Manning threw the ball away instead of taking a sack, causing the clock to stop. Declining to go for it on 4th-and-goal, Head Coach Tom Coughlin called for the field goal and the Giants only went up by six points. Now a young Giants team will have to quickly recover emotionally from a devastating loss as the team will face the potentially dangerous Atlanta Falcons next Sunday at home. In a game where the Giants defense was supposed to struggle and the offense was supposed to excel, the roles were reversed until the end of the contest. Not only did New York’s defense hold the Cowboys to only six first-half points, but the defense scored a touchdown after cornerback Trumaine McBride forced wide receiver Cole Beasley to fumble and cornerback Dominique Rodgers-Cromartie returned the loose ball 57 yards for a touchdown. On the ensuing drive, linebacker Uani’ Unga intercepted Romo at the Dallas 22-yard line, setting up a 40-yard field goal right before halftime. Meanwhile, the Giants offense puttered for most of the first half, accruing only six first downs and 86 total yards (33 rushing and 53 passing). At the half, the Giants led 13-6. The Giants received the ball to start the second half and went up 16-6 after a 12-play, 68-yard drive set up a 30-yard field goal. However, the Cowboys responded with a 9-play, 80-yard effort that resulted in a 2-yard touchdown pass to cut the New York advantage to 16-13. This drive was aided by a very questionable Rodgers-Cromartie pass interference penalty on a 3rd-and-4 incomplete pass. The score stayed that way until midway through the fourth quarter. Safety Brandon Meriweather’s hard hit on a receiver caused an interception that was returned by McBride to the Cowboys 1-yard line. One play later, Jennings scored and the Giants had a 10-point lead with just over eight minutes to play. But alas it was not to be as New York’s defense collapsed late. The Cowboys drove 76 yards in six plays to cut the score to 23-20 with five minutes to play. Then came the long drive by the Giants that almost sealed the deal until the red zone failure. The Cowboys out-gained the Giants in first downs (27-18), total net yards (436 to 289), and net passing yards (356 to 190). The Giants slightly out-gained the Cowboys in rushing yards (99 to 80). The equalizer was the Cowboys turned the football over three times while the Giants did not turn it over at all. Manning finished the game 20-of-36 for 193 yards, 0 touchdowns, and 0 interceptions. Wide receiver Odell Beckham only caught five passes for 44 yards. Running back Shane Vereen caught four passes for 46 yards. 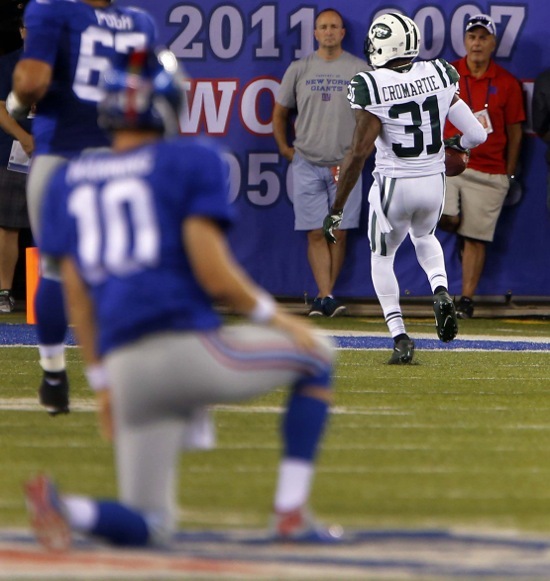 The leading rusher was Jennings who had 52 yards on 13 carries with a 27-yarder on New York’s last field goal drive. While the New York defense did force three turnovers, they rarely touched Romo who was not sacked and only officially hit once. Video highlights/lowlights of the game are available at Giants.com. DT Markus Kuhn left the game in the second half with a knee sprain and did not return. LT Ereck Flowers injured his ankle but returned to the game. Inactive for the Giants were WR Victor Cruz (calf), LB Jon Beason (knee), DE Owamagbe Odighizuwa (foot), S Cooper Taylor, TE Jerome Cunningham, OT Bobby Hart, and DT Louis Nix. The Cowboys are 8-0 against the Giants in season openers. The Cowboys have won five games in a row over the Giants. According to FOX Sports, defensive end Jason Pierre-Paul has damage to three of the fingers on his right hand and Pierre-Paul had another skin graft procedure performed recently. In addition, because Pierre-Paul has not been able to lift weights, he has lost significant muscle mass. The Giants reportedly have told Pierre-Paul that they will re-evaluate his physical condition in six weeks. New York Giants 12 – New England Patriots 9: The New York Giants defeated the New England Patriots 12-9 on Thursday Night at Gillette Stadium in Foxborough, Massachusetts in their final preseason game. The Giants finished the preseason with a record of 2-2. With the Patriots sitting their starters and the Giants choosing not to play quarterback Eli Manning and wide receiver Odell Beckham, the contest was nothing more than a glorified scrimmage. The Giants defense had little trouble with the Patriots back-ups as third-team quarterback Ryan Lindley played the entire game for New England. The Patriots went three-and-out on their first two possessions of the game and were forced to punt on their first four possessions. Aided by penalties, the Patriots did squeeze out two late first-half field goals after drives of 64 yards (on 14 plays) and 51 yards (on eight plays). Meanwhile, the Giants passing and rushing attacks sputtered for much of the game. The team’s best drive was a 10-play, 80-yard possession in the second quarter that resulted in a field goal. The Giants also had a 10-play, 44-yard drive in the first quarter that also ended with a field goal. At the half, the game was tied 6-6. In the second half, the Patriots five offensive possessions resulted in two punts, two turnovers, and a field goal. The Giants had two field goal drives, the first being an 11-play, 57-yard affair followed by a 9-play, 55-yard effort. 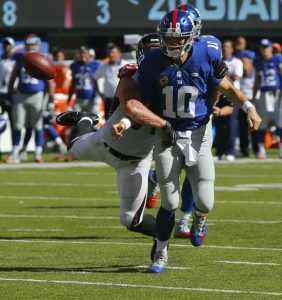 Quarterback Ryan Nassib finished the game 16-of-32 passes for 193 yards, no touchdowns, and no interceptions. He had three passes of over 20 yards, including a 40-yard deep strike to wideout Geremy Davis, a 33-yard deep throw to tight end Jerome Cunningham, and a 21-yard pass to wide receiver James Jones. The leading rushers for the Giants were running backs Orleans Darkwa (10 carries for 39 yards), Kenneth Harper (10 carries for 36 yards), and Andre Williams (8 carries for 28 yards). 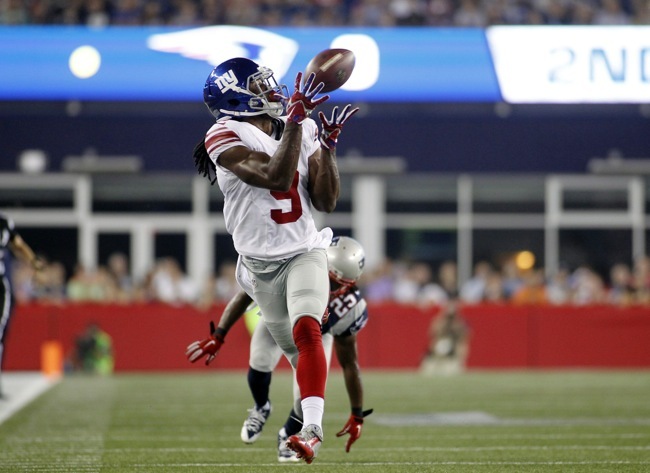 Defensively, the Giants held the Patriots to 61 yards rushing, accrued four sacks, and forced two turnovers. Defensive end Damontre Moore had a rough night with two roughing-the-passer penalties and one unnecessary roughness penalty but he closed out the game with a strip sack that fullback/defensive tackle Nikita Whitlock recovered. Defensive George Selvie had two sacks and defensive tackle Jay Bromley chipped in with another. Safety Stevie Brown intercepted a deflected pass. Meanwhile, rookie safety Landon Collins impressed with his hitting, tackling, and coverage. Defensive end Kerry Wynn also had a solid all-round game. Place kicker Chris Boswell, filling in for the injured Josh Brown, made all four of his field goal attempts from 34, 29, 33, and 41 yards out. Injury Report: TE Daniel Fells left the game with a shoulder injury but returned late in the contest. Center Brett Jones left the game with a knee sprain and did not return. Post-Game Notes: Not playing due to injuries were WR Victor Cruz (calf), WR Corey Washington (shoulder), LT Will Beatty (pectoral – on PUP), DE Robert Ayers (ankle), DE/DT Cullen Jenkins (hamstring), LB Jon Beason (knee), LB Jonathan Casillas (neck), CB Trevin Wade (back), CB Chykie Brown (knee), CB Chandler Fenner (hamstring), S Geromy Miles (groin), S Nat Berhe (calf), and PK Josh Brown (leg). QB Eli Manning and WR Odell Beckham dressed but did not play. New York Jets 28 – New York Giants 18: The New York Giants fell to the New York Jets 28-18 on Saturday night at MetLife Stadium in East Rutherford, New Jersey. With the loss, the Giants preseason record fell to 1-2. The Giants first-team offense played the entire first half and only had one good drive, their best of the preseason. It came in the second quarter on their third possession as the Giants drove 85 yards in 14 plays, culminating with a 1-yard touchdown run by running back Rashad Jennings. The Giants were in the no-huddle for most of the drive and having success both running and passing the football. But other than that possession, the first-team offense sputtered. The team only picked up two first downs and 32 yards on their other four first-half possessions. Worse, quarterback Eli Manning, who otherwise had a good night, finished the first half with an interception that was returned for a defensive touchdown with only seconds to play before halftime. Meanwhile, the first-team defense continued to struggle, having issues defending the run, rushing the passer, and covering receivers. The Jets scored touchdowns on two of their first-half possessions, including a 7-play, 64-yard drive and a 6-play, 73-yard drive. The Jets led 21-7 at the half. With most of the starters on the bench, the Giants received the ball to start the second half and cut the score to 21-10 as quarterback Ryan Nassib led the Giants on an 11-play, 54 yard drive that resulted in a 48-yard field goal by place kicker Josh Brown. But after stopping the Jets on offense, the Giants were forced to punt from their own 2-yard line. Robert Malone’s punt was returned 54 yards for a touchdown by the Jets as they went up 28-10. Nassib and the Giants moved the ball well on their last possession of the third quarter, but after a 15-yard reception, wide receiver James Jones fumbled the ball away at the Jets 19-yard line. Midway through the fourth quarter, Nassib orchestrated a 10-play, 80-yard drive that resulted in a 6-yard touchdown throw to tight end Jerome Cunningham and a 2-point conversion on a pass to wide receiver Julian Talley. The score was cut to 28-10. However, the Jets successfully ran out the clock in the last 7:31 of the game, driving from their own 20-yard line to the Giants 24-yard line. Offensively, Manning finished the game 12-of-16 for 91 yards, no touchdowns, and one interception. Nassib was 11-of-18 for 122 yards, one touchdown, and no interceptions. The Giants rushed for 106 yards, but 30 of those yards came from Nassib. The leading running back was Rashad Jennings with 28 yards on nine carries. Wide receiver Odell Beckham caught five passes for 31 yards, while wideout James Jones had four catches for 54 yards. Defensively, the Giants did very little. They gave up 136 yards rushing, had only one sack (by safety Cooper Taylor), and forced no turnovers. Injury Report: DE Robert Ayers suffered an ankle and/or Achilles’ tendon injury in pre-game warm-ups and did not play. RT Bobby Hart injured his knee in the third quarter and had to be helped off of the field. Cornerback Josh Gordy left the game in the second half after suffering a hip injury. Post-Game Notes: Not playing due to injuries were WR Victor Cruz (calf), OC Weston Richburg (knee), RT/RG Brandon Mosley (back), LT Will Beatty (pectoral – on PUP), DE Robert Ayers (ankle), DE George Selvie (knee), LB Jon Beason (knee), LB Jonathan Casillas (neck), LB Mark Herzlich (concussion), CB Chykie Brown (knee), CB Chandler Fenner (hamstring), and S Nat Berhe (calf). QB Ricky Stanzi and TE Will Tye were dressed but did not play. The New York Giants are the NFL’s most successful cursed franchise. Does that sound oxymoronic? Certainly. But no one will convince me otherwise. In their 90-year history, the New York Giants have won eight NFL titles, the third most in the NFL. The team has appeared in 19 NFL championship games. Four of the NFL titles and five of the NFL championship game appearances have occurred in the last 30 years. 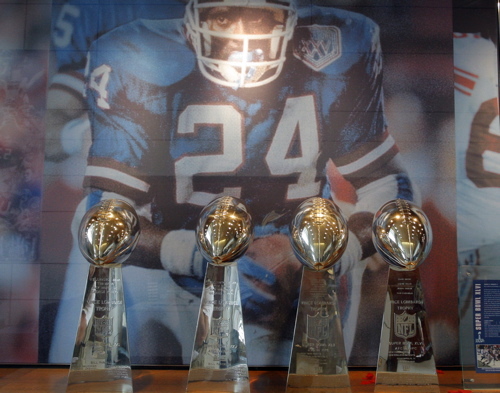 The Giants are the only NFL team to win two NFL titles in the last eight seasons. How can the team possibly be considered “cursed”? You want to talk about “cursed”, talk to fans of the Lions or Eagles or Browns. This article isn’t about the lost decades of the 1960’s and 1970’s or the many catastrophic game collapses such as “The Fumble” in 1978, the 1997 playoff game against the Vikings, and the 2002 playoff game against the 49ers. It’s about how the Giants have been slammed by a series of mind-numbing, career-impacting injuries to many of their best players in the last 10 years, including bizarre off-the-field accidents. All Giants fans know that the team has been terribly impacted by injuries in recent years. The stats compiled by Football Outsiders clearly prove that no team has been more affected by injuries over an extended period of time. But what the stats don’t show is that many of these injuries have been career-ending or career-impacting to many of the team’s best players and high draft picks at relatively young ages. WR Plaxico Burress: One of the best receivers in team history. In 2008, the Giants were 10-1, including having already beaten both eventual Super Bowl participants at their stadiums, when Burress accidentally shoots himself in a nightclub. The event ended his season and career with the Giants at the age of 31. New York faded down the stretch and was knocked out in the first round of the playoffs. WR Steve Smith: A former 2007 2nd-round draft pick, in 2009, Smith became the first Giants receiver to be voted to the Pro Bowl since Homer Jones in 1968. The following year, Smith suffered a knee injury that basically ended his career at the age of 25. He left the Giants after the season and retired in 2013. TE Kevin Boss: A very solid two-way tight end, Boss saw his career with the Giants prematurely end after the 2010 season at the age of 26 when he signed a free agent contract with the Oakland Raiders. As subsequent events proved correct, the Giants were concerned about Boss’ repeated concussion history and chose not to match the Raiders’ contract offer. TE Jake Ballard: Boss’ replacement, Ballard surprised everyone by quickly turning into a very solid two-way tight end in 2011, being an important part of the 2011 championship team. However, Ballard’s career ended at the Super Bowl when he wrecked his left knee. 24 years old, Ballard never played for the Giants again. S Kenny Phillips: A former 2008 1st-round draft pick, injuries to both knees (one in 2009 and the other in 2012) negatively impacted and prematurely ended Phillips’ promising career with the Giants after the 2012 season at the age of 26. Phillips is now attempting a comeback with the Saints. RB Ahmad Bradshaw: The sixth-leading rusher in team history saw his career with the Giants prematurely end at the age of 26 after the 2012 season due to chronic foot issues. CB Terrell Thomas: A former 2008 2nd-round draft pick, Thomas suffered ACL tears to the same knee in 2011 and 2012. Although he played in all 16 games in 2013, he was never the same promising player and was out of football at the age of 28. WR Hakeem Nicks: A former 2009 1st-round draft pick, Nicks’ extremely promising career with the Giants ended in 2013 at the age of 25 after suffering compartment syndrome (swelling in the lower leg that compresses nerves and blood vessels, possibly causing permanent damage). Before the injury, Nicks looked primed to be a franchise all-time great. RB David Wilson: A former 2012 1st-round draft pick, Wilson’s career ended at the age of 22 in his second season due spinal stenosis. Wilson proved to be an extremely dangerous kick returner and may have been particularly well suited to Ben McAdoo’s offense as a runner and receiver. 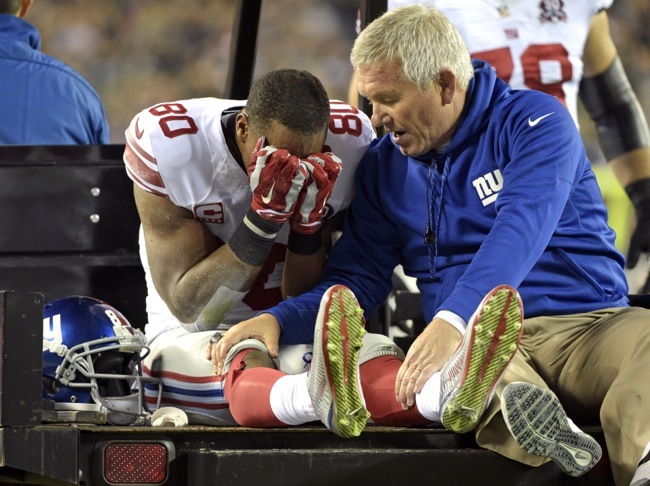 WR Victor Cruz: One of the most productive players in franchise history and a Pro Bowl receiver, Cruz suffered a potentially career-altering patellar tendon knee injury in 2014 at the age of 27. Cruz is expected to play in 2015 but it remains to be seen if he will be the same dynamic football player. DE Jason Pierre-Paul: A former 2010 first-round draft pick, Pierre Paul had a breakout season in 2011 when he dominated as the game’s best two-way defensive end. Injuries caused him to regress in 2012-13 before a bounce-back season in 2014. A fireworks accident in July 2015 caused severe damage to his right hand, including an amputated finger. Pierre-Paul’s best days may already be behind him at the age of 26. There is also a good chance he won’t be a New York Giants after 2015. There are many other Giants who saw their already-excellent careers prematurely end or affected by major injuries recently including DE Justin Tuck (shoulder and neck), OG Chris Snee (hips and elbow), OG/OC Rich Seubert (knee), OC David Baas (neck and knee), DE Mathias Kiwanuka (knee and neck), and RB Brandon Jacobs (knee). This is not to mention all of the “could-have-beens” such as DT Jay Alford (knee), LB Jonathan Goff (knee), and OL Adam Koets (knee). So it’s not just the sheer volume of the injuries, but the quality of the players impacted at relatively early ages. Many of the players lost were key cogs in the two recent championship runs and they were expected to remain important parts of the team for many more years. Giants fans thought Steve Smith and Hakeem Nicks would be favorite targets for Eli Manning for 10 years. The Giants lose Kevin Boss and his replacement is done one year later. The secondary takes a big hit with the losses of Kenny Phillips and Terrell Thomas. Ahmad Bradshaw and David Wilson still should be in the backfield. Who knows how long Victor Cruz and Jason Pierre-Paul will now remain Giants? In addition, the off-the-field accidents exacerbate the “cursed” feeling. Burress shoots himself in the leg and ends up in prison. Wilson’s neck was an unknown issue before the team drafted him. Offensive tackle Will Beatty tears his pectoral muscle lifting weights. Pierre-Paul mutilates himself setting off fireworks. 2010 3rd-round draft pick safety Chad Jones suffers career-ending injuries in a traffic accident. That event recalled terrible memories of defensive end Troy Archer dying in a car accident in 1979 and center Kevin Belcher’s career ending due a traffic accident in 1985. The sum total of all of these unfortunate events is that fans feel shell shocked by all of the bad news. We’re tired of it. Despite the team’s undeniable success, many are left wondering about a missing ring or two because of departure of much of the team’s top talent in its prime. No team can keep losing its best players and remain competitive. Are the “Football Gods” exacting their tribute for the two magical runs in 2007 and 2011? Perhaps. Regardless, all of this leaves a bad taste. Enough is enough. Pick on some other team for a while. When the Atlanta Falcons stepped up to the plate and volunteered to be featured on HBO’s Hard Knocks, the sigh of relief from Tom Coughlin and Jerry Reese could be felt miles away. But while this year’s New York Giants won’t be featured on the network, a team that last played 56 years ago will. According to the New York Post, HBO will begin filming a movie entitled The Glory Game, based on Frank Gifford’s book detailing the 1958 NFL Championship. Gene Kirkwood, Ross Elliott and Cody Gifford will produce the film. The Glory Game was originally published in 2009 and is based around what has been coined “The Greatest Game Ever Played.” In 1958, the Giants and Baltimore Colts faced off in the NFL championship. The game, which was televised across the nation on NBC, was the first championship to go into sudden death overtime. The Colts won, 23-17, on fullback Alan Ameche’s one-yard touchdown run. The film is still in the early stages of development and has yet cast any actors or actresses. The New York Giants and Dallas Cowboys will be facing off just a bit earlier than the team’s first scheduled regular season match-up Oct. 19. This Sunday, on July 13, at 3:00 PM, the ‘Doomsday Defenders’ will face the ‘NYG Hoopsters’ at The Pine Belt Arena in Toms River, New Jersey for a basketball game. The matchup will bring together both past and present Giants’ and Cowboys’ players. Rosters are still presently being put together, but confirmed athletes dressing up for the ‘Doomsday Defenders’ will be Ed ‘Too Tall’ Jones, Kevin Smith, Drew Pearson, Cole Beasley and Dwayne Harris. Suiting up for the ‘NYG Hoopsters’ will be Antonio Pierce, Jessie Armstead, Stephen Baker, Eric Dorsey and Bennett Jackson. Following the game, which which runs every two years, players will be made available for an autograph signing session. For complete information on the game and how to purchase tickets, visit Cowboy Hoops online. It was a good decade for the New York Giants. Between 2000 and 2009, the team appeared in two Super Bowls with one championship and defeated the unbeatable 18-0 New England Patriots in Super Bowl XLII. But according to Charley Casserly, one Super Bowl-less squad was more impressive during the nine years. The former NFL general manager ranked the Philadelphia Eagles No. 4. Casserly placed the Indianapolis Colts (No. 3), Pittsburgh Steelers (No.2) and New England Patriots (No.1) ahead of Big Blue. The Baltimore Ravens, who defeated the Giants in Super Bowl XXXV, tied with New York at No. 5. During the years polled, the Giants finished a combined 88-72. The team had a winning record five times, won the division three times and made the playoffs six times. In 2000, the Giants finished 12-4 and won both the NFC East Division and NFC Conference championships. In the Super Bowl, the Giants fell, 34-7, to the Baltimore Ravens. Seven years later, the Giants captured their lone Super Bowl of the decade by defeating the 18-0 New England Patriots, 17-14. “They won the Game of the Decade beating the 18-0 New England Patriots in the Super Bowl,” Casserly said. While the team didn’t capture a Super Bowl title, the Eagles were one of more successful regular season teams during the same time period. Philadelphia had a losing record just once in the nine years, made four-straight conference championships and appeared in one Super Bowl. The team also won the NFC East in 2001, 2002, 2003, 2000 and 2006. The Eagles combined record from 2000-2009 was an impressive 103-56-1. Do you agree or disagree Giants with the Giants’ ranking? Feel they should be higher or lower? Voice your opinion here. Special thanks to John Berti for use of his exclusive All-Time Giants roster. The 2014 season will be the New York Football Giants 90th campaign, giving them the fourth-longest tenure in the National Football League. The franchise has won the third-most titles in league history, has the third-largest membership enshrined in the Pro Football Hall of Fame, and has retired the second-most jersey numbers. A legacy with such breadth and depth requires an adjustment by the observer to appreciate the men whose shoulders the players and coaches of today stand upon. The timeline of professional football is a continuum of experimentation, change, evolution, and adaptation. Over that span of time, the franchise has played 1,289 regular- and post-season games with 1,631 players on their active game-day roster. Some might consider the intent of distilling those numbers in a qualitative manner to be sheer absurdity. To do so in a mass manner probably would be. Identifying and defining specific eras that represent the main epochs the players performed in was the first step. How many times have you heard an announcer describe a current player as being a “throw-back”? Certainly a remark like that is intended to be a compliment, but upon further analysis, what specific attributes make him a “throw-back”? What point in time are you throwing him back to? The 1980’s…1950’s…1920’s? They are all significantly different, and that is where we started. I say “we” because this admittedly ambitious task proved to be far more than I could absorb on my own. I felt it to be of great importance to be done properly and respectfully. I was quick to reach out for assistance in both research and critical feedback. My underlying theme the entire time was to “be objective without being arbitrary.” The distinct rosters of players and coaches are not simply a reflection of my opinion. I removed and added names in deference to the beliefs of others. Recognizing the player’s unique talents within the framework of the period they performed in is essential. I do not buy into the belief that players today are superior to the ones prior because they train year round and are allegedly stronger and faster. Most today would not fare well at all in the single-platoon era. The linemen are too heavy and would lack the stamina to play both sides of the ball for at least 45 minutes. The receivers and defensive backs are too small and would not withstand the pounding. The pocket quarterbacks are too immobile to play defense. I am not saying the players of the early era are better either. The truth is the game has become specialized. Coaches have different philosophies and expectations, rules have changed, and equipment has evolved. All of these variables have influenced what a football player needed to be in his respective time. Once the periods were defined, the next challenge was deciding who was worthy. The theme that arose numerous times was weighing a steady performance over a lengthy period of time versus a high level of performance in a relatively brief span. The answer to that question is not an easy one. The example that illustrates this best is the careers of Charlie Conerly and Y.A. Tittle. Hence the decision to include the “honorable mention” designation. Of course, this presented a new challenge. While we strove to keep this project as inclusive as possible, we walked a tight rope of mentioning so many other players that the honor would become diminished. Statistics were taken into account of course, but they are just a reference and not the sole basis for analysis. Passing and receiving records are reset at such a pace today that they are a blur and easy to ignore. Are the passers and receivers that much better than the ones of yesteryear? Of course not. Ed Danowski would have loved to have been able to throw a pass behind a pocket where his linemen were permitted to block with their hands, giving him time to read through his progressions to find a receiver freely roaming through a defense that was bound with restrictions on contact before and after the ball arrived. Conerly’s season-high of 2,175 passing yards in 1948 is no more or less impressive than Eli Manning’s 4,933 in 2011. At the dawn of the passing era, teams typically had one end who was considered a receiving end while the other was essentially an in-line blocker. There were usually three backs behind the quarterback as well. The passing options were limited, the strategies still primitive, and the rules prohibitive. Teams ran the ball more because that was their best chance for success. In 1925, a statement like that was taken literally. The Giants starting 11 were just that. And the team that took the field for the New York Giants first game in Providence, Rhode Island in October of 1925 looked a lot different than the one that will be on the field in September of 2014. The 2014 Giants will have 22 starters, 11 for each side of the ball. That number rises even higher when specialists for place kicking, punting, long snapping, and returners are taken into consideration. In the early years, roster size demanded versatility. Players who were singularly-talented in 1925 were a luxury who could not be afforded. The NFL roster in 1925 was 16 players – a contingent that would not even comprise a single platoon in 2014. Versatility was not the only attribute a player in 1925 needed. Endurance and toughness were equally important. When Benny Friedman threw an interception, he did not walk over to the Giants bench to put on a headset and talk to a coach in the press box. First, there was no such coach to review misreads, coverages, and progressions. Second, he just stepped into the defensive huddle and dropped back to his safety position. His best response was to intercept his counterpart and get the ball back, if they chose to even pass the ball. The factors influencing this have to do both with rules and equipment. The ball in use at the time had a broad circumference that was far better for drop kicking than passing. A rugby-style underhanded toss gave a more accurate trajectory than an overhand aerial, which was more like a heave of desperation. The rules of the day provided even greater risk. The passer had to be five yards behind the line of scrimmage to legally attempt a down-field throw; this usually alerted the defense that a forward pass was coming. A pass out-of-bounds or two successive incompletions resulted in a loss of possession, and an incompletion in the end zone was a touchback. When the offensive team was in an unfavorable position, the accepted strategy of the era was to quick kick or punt the ball away, maintain favorable field position, and wait for the opponent to make a mistake. Generally speaking, following a change in possession, players would most often line up against the same counterpart. The offensive center was usually the middle guard or linebacker on defense. The offensive guards were the defensive tackles, the offensive tackles were the defensive ends, the fullback was the linebacker, the tailbacks and quarterback were the defensive halfbacks and safeties, and any number of the above would kick or punt. Wing-style football offered deception and faking in the running game. The tailback was the primary ball handler, while the quarterback, who had the play calling responsibilities, was primarily a blocker. The off tackle slant was the basic play, and the tenet was to get to the point-of-attack and mow the defensive front down. Pass protection was weak due to the unbalanced line and backfield; the tailback often made his throws on the move. Offensive lines were often unbalanced while defensive lines were spread out wide, usually covering the outside shoulders of the offensive ends. The center could snap the ball to any member of the backfield. Passes were thrown up for grabs in rudimentary fashion while the most complex execution was displayed on end-around runs, reverses, laterals, and spinners. The style of play was different as players needed to preserve their bodies. Blocking and tackling were done with the shoulders and side body; players avoided pile-ups and rarely launched themselves at the opposition. Enduring the full 60-minute contest was considered a badge of honor. Anyone who asked out of a game risked his reputation among his peers. If a player was taken out of a game for injury, he was ineligible to return until the start of the next quarter. Free substitution, which was not experimented with until World War II, put constraints on rosters and was not adopted full time until 1949. The NFL followed the college rule book until 1933 and did not distinguish itself until it began to craft its own style. The football itself was gradually streamlined until it reached its current dimensions of 11 inches in length and 21.25 – 21.50 inches in circumference at the center in 1934. The pros first step forward toward innovation was the exploration of the passing offense, while the colleges remained firmly grounded with the run. While football slowly became more strategically complicated, it remained brutally fundamental. Mass interference at the line of scrimmage remained the favored method of advancing the ball until the early 1950’s. 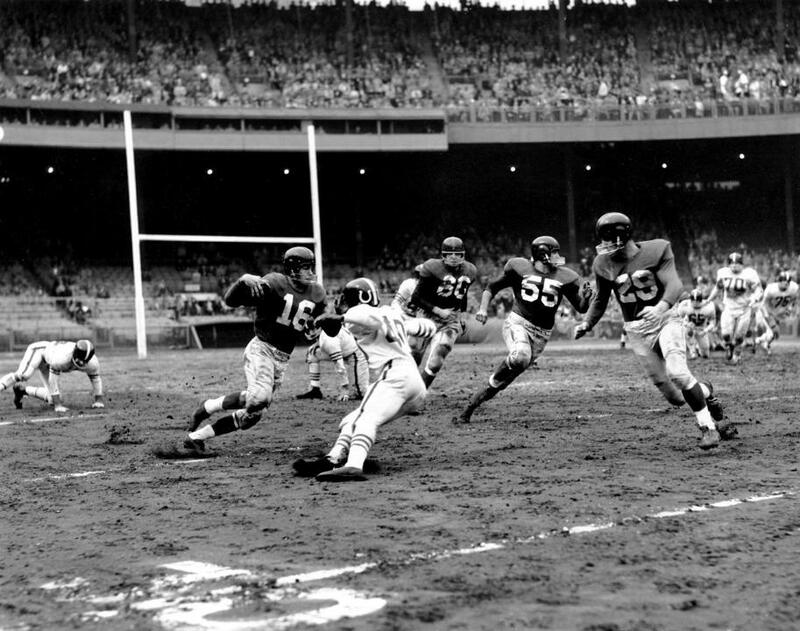 Significant steps to facilitate ball movement and scoring were taken in 1933: goal posts were moved up from the end line to the goal line, hash marks were placed 10 yards in from the sidelines (called “in-bounds lines”), and forward passing was allowed from anywhere behind the line of scrimmage. Players emerged from the morass and became more visible in the open spaces, occasionally offering hints of technical specialization. The league was divided into two divisions, with the first-place teams meeting to decide the championship. In 1936, the first organized college draft was held, just in time for the Giants first training camp featuring tackling dummies and blocking sleds. The following year the NFL formed its own rules committee to look for ways to improve the game. Their first major decision was to institute the roughing-the-passer personal foul in 1938. All of this differentiated the professionals (still commonly referred to as “post graduates”) from the colleges, stimulated fan interest, and helped to stabilize league. Franchises folded and relocated far less frequently. Schedules remained unbalanced and unorganized but rosters became more settled. By the close of the 1940’s, rosters had doubled in size to 32, and finally, pro football re-integrated in 1946. The All-Time New York Giants Team from professional football’s nascent era represented New York as well as any group of players and coaches from any other era. Although they won three world championships, they were not glamorous and many have faded toward obscurity. But that does not diminish their significance nor diminish their importance. These New York Giants played for the simple love of the game more than any generation that has come since. One of the NFL’s best tackles in the 1920’s. Won three championships with the Giants; one as a player in 1927 and two as head coach in 1934 and ’38. Giants all-time leader in coaching victories, his teams won eight NFL Eastern Division titles. Considered a defensive coaching genius of his era. 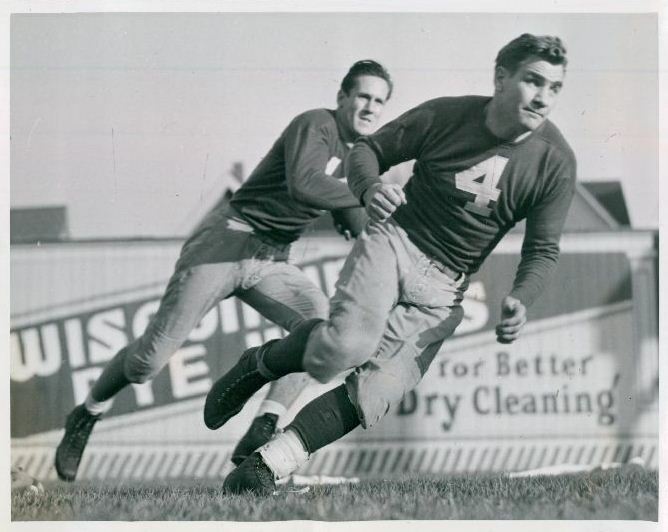 Pioneered early implementation of hybrid linebackers as far back as the 1930’s. Devised the Umbrella Defense in 1950, which included early implementation of zone coverage, to neutralize the Cleveland Browns passing attack. Offensively, created his signature A-Formation that featured an unbalanced line and backfield. “The best offense can be built around ten basic plays. Defense can be built on two. All the rest is razzle-dazzle, egomania and box office.” Owen’s Giants defenses led the NFL in fewest yards allowed six times, fewest points surrendered five times, and most takeaways eight times. Consistent performer who was stout on both sides of the line. Driving run blocker and aggressive defender. In 1944, he blocked four punts, all of which were returned for touchdowns. Started in the first three NFL Championship Games. Team captain in 1936. Strong and agile. Inspirational leader. Started at center, moved to guard. Great run blocker on offense. Courageous performer in 1938 NFL Championship Game. Vicious linebacker on defense. Instinctive and competitive player. Very physical. One of the finest centers ever to play football. Was also a fantastic middle guard/linebacker who could impact the course of a game. Had the speed to cover ends like Don Hutson while making bone-jarring tackles of power backs such as Bronko Nagurski. Had an interception return for a touchdown in a key late-season victory over Green Bay in 1938. The NFL’s version of Lou Gehrig: a true 60-minute player who never left the field during Steve Owens’s two-platoon system. His 15 seasons played have only been matched twice in Giants history. Combined great stamina, mental alertness, and superior athletic ability to become an exceptional star. Giants captain for 10 seasons. Linchpin of the A-Formation’s success. Powerful and intelligent, exceptional at angle blocking defenders. Defensively, had a knack for interceptions, and Owen said Hein was the best tackler he had ever coached. The New York Giants selected Younce in the eighth round of the 1941 NFL Draft. Played six seasons on the offensive line, helping the team reach the NFL Title game three times. Strong run blocker. Also played linebacker, and handled punting and placekicking duties at times. Set the Giants record for longest punt with a 74-yard effort in 1943 which lasted 58 years. Returned an interception for a touchdown versus the Steagles in 1943, led the league in punting yards in 1944, and made 36-of-37 extra-point attempts in 1948. Finished his career with 10 interceptions. The Giants first team captain. Led the NFL in receptions, yards, and touchdown receptions in 1932, the first year statistics were officially recorded. Had very good speed and made big plays. An excellent defensive player. Suggested the Giants switch to sneakers during the 1934 NFL Championship Game. Served double-duty as player/coach for two games during the 1933 preseason while Steve Owen tended to his wife with a terminal illness, and was a player/coach for the full 1935 season. Large player for his era. Crashing end on defense and strong blocker on offense. Reliable receiver. Blocked two punts in the 1938 NFL Championship Game. Led Giants in receptions in 1946. Cited by Steve Owen as one of the best the Giants ever had. Led the NFL in passing yards and efficiency in 1935. Had the best touchdown-interception ratio of his era, was also a consistent rusher and was a good punter. Won two NFL Championships as starting tailback. Passed and ran for touchdowns in 1934 NFL Championship Game versus Chicago in 1934. Threw winning touchdown in NFL Championship Game versus Green Bay in 1938. Has the longest Giants punt in a post-season contest. The NFL’s first great passer of the 1920’s. Helped to attract the public’s attention to the pro game with his passing highlights featured in newsreels. Also a premier ball-carrier who ran with power. The Giants scored 312 points in 1929 (no other team even scored 200) with Friedman setting an NFL record with 20 touchdown passes. He also rushed for two touchdowns and led the NFL in point-after-touchdowns. Intelligent player/coach. Was in line to become the Giants head coach in 1932 but left the team following a contract dispute. The Giants first star player. Elusive, big-play back with breakaway speed. Scored first rushing and receiving touchdowns in team history on November 1, 1925 versus the Cleveland Bulldogs. Scored the first kickoff return touchdown in team history versus the New York Yankees on December 4, 1927. Haines successfully executed a fake punt for a first down in the critical 13-7 late-season win over the Chicago Bears that enabled the Giants to win their first NFL Championship. Never missed a game in 15 years. His 170 regular-season games still ranks 10th all-time for the Giants. Also played in eight championship games and one divisional playoff. Multi-positional player: halfback, wingback, defensive halfback. Also punted and place kicked. Led second-half effort in Giants 1938 NFL Championship Game. Led the Giants in receiving yards twice, the NFL in field goals three times, and the NFL in PAT’s once. Scored on a then-team record 96-yard interception return in season-finale versus Washington in 1938. Solid blocker as a wing back, fast enough to run a reverse, excellent coverman on defense. Exceptional straight-ahead kicker who left the team as New York’s all-time leading scorer. One of the most versatile players of his era: triple-threat rusher, receiver, and passer from the backfield. Place kicked and punted. Vicious blocker – considered one of the best of his era. Also one of the best defensive players of his era. Accurate straight-ahead kicker. Scored 17 points, an NFL Championship Game record that stood for almost 30 years, including two fourth-quarter touchdowns in the 1934 NFL Championship Game versus the undefeated Bears. Returned to Giants as place-kicking specialist in 1940’s. Served as kicking coach after playing career ended. Led the NFL in scoring in 1933 and retired as the Giants all-time scoring leader. Has the Giants longest punt return in a post-season game. Also scored on a 42-yard touchdown reception from Ed Danowski in the 1935 NFL Championship Game. Retired as the NFL’s all-time leading scorer. Led the NFL in rushing in 1936. Threw 25 TD passes over career during regular season, one in 1939 NFL Championship Game. Retired as the Giants career rushing leader in 1943. Scored a touchdown in 1938 NFL Championship Game versus Green Bay. Steady defensive player. Commissioner Bert Bell: “Leemans makes all tacklers look bad.” Fierce competitor, played through injuries. Known by fans as “Mr. Giant.” Strong short-yardage back with break-away speed. Also lead the Giants in passing as the A-Formation tailback in 1941 and 1942. Multi-position player on offense; outstanding defensive halfback and safety. One of Steve Owen’s favorite players. Called the Giants defenses, which led the NFL in fewest points allowed four times during his career. Scored the winning touchdown in the 1938 NFL Championship Game. Lead Giants in rushing in 1937. Giants leading passer and first team captain. Threw the first touchdown pass in team history on November 1, 1925 versus the Cleveland Bulldogs. Recorded the first successful placement style point-after and field goal in team history. Led the Giants in scoring in 1925, 1926, and 1927. Excellent safety, unofficially led the Giants in interceptions several times before statistics were standardized. Was primarily a blocking back during his second tenure. The only Giants player who was a member of the 1927 and 1934 championship teams. Versatile offensive player with speed and agility. Blocked and handled the ball well. Owen cited Burnett as one of the best pass catching players of his era. Very good in coverage on defense. Returned an interception 84 yards for a touchdown (a team record at the time) in a late-season win versus Green Bay in 1933. At the time of his retirement, his 86 receptions and 25 touchdowns scored were franchise records. Leather helmets, the Single Wing, and six-man defensive lines were relegated obsolete by the middle of professional football’s most romanticized decade – the 1950’s. Pocket protection, men-in-motion, and coordinated defenses attracted a new, more analytical audience. Nevertheless, the game was still as physical as ever as the NFL signed its first network television contract with DuMont in 1953. In 1951, interior linemen were no longer permitted to run interference downfield on pass plays. Offensive strategies calibrated their timing and exploited space as they attacked further away from the line of scrimmage. Defenses responded by emphasizing athleticism over brute force. In 1954, all players entering the league were required to wear facemasks, even if some of them were Lucite. Schedules were better organized as teams played a set 12-game schedule that featured round robins within their respective conference and rotations with half the teams in the other conference. As the league prospered, player salaries gradually increased. Coaches deepened preparation with film study, scouting, and staffs that now had coordinators and position coaches. The players unionized with the formation of the NFL Players Association in 1956. The 1960’s was a decade of expansion. New teams joined the NFL as it competed with the new AFL. A league-wide television deal was finalized in 1961 ensuring that every game would be broadcast. That same season, the 14-game schedule was introduced. In 1965, the game-day officiating crew increased from five to six when the Line Judge was added. By the end of the decade, defenses gained the advantage over complex offenses by employing more involved strategies of their own – lateral movement, play recognition, and zone coverages were a part of every defensive scheme. For the first time in three decades, scoring was on the decline. Part of the reason for a decrease in offensive touchdowns was a quantum leap in the quality of place kicking. The new breed of soccer-style kicking had an immediate impact on the game. In 1968, the NFL experimented during the preseason by not allowing teams to kick the point-after-touchdown during inter-league NFL-AFL matchups. Instead, teams had to run a play from scrimmage. Following the AFL-NFL merger, two waves of drastic changes to tip the advantage back to the offense were implemented by the rules committee. The first came in 1974. Kickoffs were moved back from the 40-yard line to the 35-yard line and the goal posts were moved back from the goal line to the end line. The penalty for offensive holding was reduced from 15 yards to 10 yards. Also, a 15-minute overtime period was added to regular season games, making the anti-climactic tie games a rarity. Rosters grew past the 40-player plateau and reached 43 by 1977. The age of specialization was dawning. The New York Giants who played during this era may have only claimed one world championship of their own, but they were just as talented as the players from the other two eras. They grew with the times and gained their own unique recognition as professional football ascended to the forefront of public consciousness. There are more Giant players and coaches enshrined in Canton from this era than any other. Played end and coached ends under Steve Owen. Blocked a punt in the 1938 NFL Championship Game. As head coach, led the Giants to three Eastern Conference titles and the 1956 NFL Championship. Never had losing season as head coach. Was the first head coach to explicitly delegate authority to offensive and defensive coordinators, which gave rise to the modern coaching staff. Implemented modern T-Formation offense with the Giants. Made the sweep his signature play. Helped make stars of Roosevelt Brown and Frank Gifford. 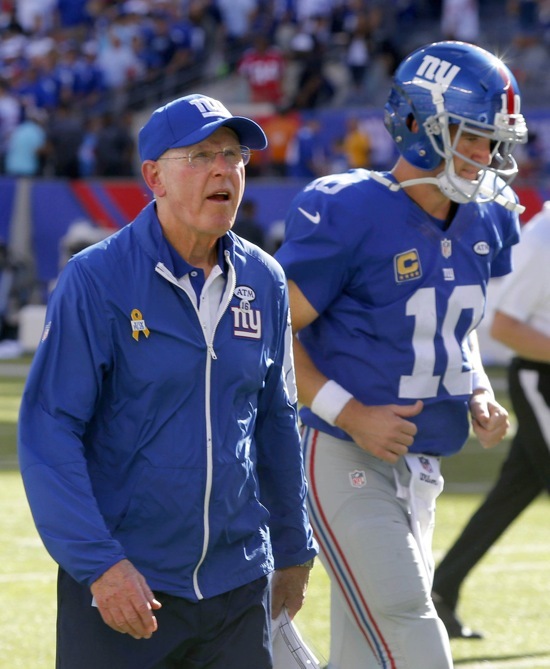 The Giants ranked in the top three in the NFL for fewest turnovers in four of his five seasons as coordinator. Intelligent player, sure tackler. Served as player/coach and quasi-coordinator under Steve Owen. Revolutionized how defensive football is understood and coached. Emphasized charting tendencies and reading keys. Holds Giants record with an interception in seven consecutive games. The first Giant to return interceptions for touchdowns in consecutive games. Was an excellent punter and occasionally played as T-Formation quarterback. Returned punts and kickoffs. Owen called him “the quarterback” of the defense. The Giants defense led the NFL in fewest yards allowed 1956 and 1959 and the fewest points surrendered in 1958 and 1959. The 1954 Giants defense led the NFL in takeaways. The Giants first 1,000-yard receiver. Holds team record with 269 receiving yards in a game. Second highest yards-per-reception in team history (18.1) for a player with over 150 catches. Had four games where he scored three touchdowns, a team record. 13 career 100-yard receiving games. NFL’s all-time leader in yards-per-reception (22.3). Holds team record with 13 touchdown catches in a season. Fifth all-time for Giants in receiving yards and touchdowns. Led the NFL with 13 touchdowns in 1967. 10 touchdowns of 70 or more yards are the most in Giants history. Seventeen 100-yard receiving games second most in team history. Starting left tackle for 13 consecutive seasons. Played in nine Pro Bowls. Tremendously strong drive blocker with the speed and athleticism to run interference downfield and on sweeps. Played defense in short yardage and on the goal line. Was only the second modern era offensive lineman enshrined in the Pro Football HOF. Came to Giants as a defensive tackle, switched to offense during second season. Somewhat undersized but strong, quick, and athletic. Appeared in 135 games. Excellent pass blocker who was adept at pulling to lead sweeps. Smart and efficient player who was able to block and control larger defensive opponents. Played in 120 games. Appeared in 75 games. Began as a two-way player before being permanently entrenched at offensive guard. Was a key component in the Giants Power-T formation in the mid 1950’s pulling on sweeps. Started in the 1956 NFL Championship Game. Versatile – started at tackle and guard before moving to center. Tough player who led by example. Returned from a severe knee injury in 1964 and played in the 1966 Pro Bowl. Played in 179 games. Retired with Giants team record 133 consecutive games played. Quick and aggressive. Referred to by Allie Sherman as “the quarterback up front.” Made the challenging transition from A-Formation center to T-Formation center. Steady performer at multiple positions. Giants team captain in 1976. Great technician who used quickness and footwork to redirect opponents. Played in 172 games with 169 starts. Tough, multi-position performer. Played through injury and was respected by both teammates and opponents. Athletic, excelled as a pass-blocking tackle and pulling guard on sweeps. Was the Giants offensive captain. Appeared in 132 games. Led the NFC in receptions 1971. Sure-handed receiver. John Mara: “Bob was revolutionary for his time.” Was a very reliable performer despite playing with numerous quarterbacks throughout his career. Had five 100-yard receiving games. Giants team captain. Adept at underneath routes to covert third downs. Started as a halfback, but knee injury necessitated change of position after rookie season. Combined power, polish, and determination in all his roles. Franchise touchdown-receiving record stood for 47 years. Played six different positions over 14 years with the Giants, including defensive back. Retired as the team franchise leader in receptions and receiving yards. Holds team record with touchdown receptions in seven consecutive games. As a receiver, third all-time team leader in catches, fourth in yards, and third in touchdowns. One of the most versatile athletes ever to wear a uniform. The only player in NFL history to play in the Pro Bowl on offense and defense, and at three different positions: defensive halfback, halfback, and flanker. Retired as the Giants all-time leader in all-purpose yards. Scored the most touchdowns in Giants history (34 rushing, 43 receiving, one interception return). Also threw 14 touchdown passes, kicked 10 point-afters, and two field goals. Scored touchdowns in three NFL Championship Games. Holds team record for touchdowns in 10 consecutive games. Led the NFL in all-purpose yards in 1956 and retired with team record 9,862 all-purpose yards. Inspirational leader who often played through injury. Great runner who became a reliable blocker and receiver. Retired as the Giants all-time leader in rushing yards and touchdowns (still ranks fifth in both). Scored two touchdowns in the 1956 NFL Championship Game versus the Chicago Bears. Retired as the Giants third all-time leading receiver in catches, fourth in yards, and fifth in touchdowns. Retired with all Giants major passing records. Started as tailback in A-Formation. Set NFL record for passing touchdowns for a rookie in 1948 – a record which stood until 1998. Quietly tough, led by example. The Giants leading passer for 12 consecutive seasons. At the time of his retirement, his 14 years of service were second only to Mel Hein’s 15. His single-season records of touchdowns passing and yards passing stood until Y.A. Tittle broke them. Threw two touchdown passes in the 1956 NFL Championship Game and rushed for the game’s only touchdown in the 1958 Eastern Conference Playoff versus Cleveland. The quality of his quarterbacking over a three-year span has never been surpassed in team history at a time when his career was thought to be finished. Set the NFL single-season passing touchdown record in 1962 and surpassed it in 1963, a record that lasted until 1984. Led the Giants to three consecutive Eastern Conference titles. 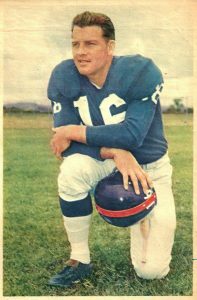 Set Giants record for passing yards in a season in 1962, which lasted until 1984. Exuberant leader. His 18 games with three touchdown passes were a team high at the time of his retirement. Was the first Giant to achieve a perfect passer rating of 158.3 in 1963. Leader of the Giants defenses of the late 1950’s and early ’60’s. Masterful pass rusher with a variety of moves. Saved his best for big plays near the end of games. Unofficially had 79 career sacks. Served as player/coach in 1962-64. Supplied the entire Giants team with sneakers for the 1956 NFL Championship Game. Combined speed, power, and a relentless desire to become one of the most disruptive players from the defensive tackle position in history. One of the first defensive players to cultivate fan interest and gain notoriety. Keen instincts, diagnosed plays at the snap. Sometimes unstoppable interior pass rusher. Talents allowed Steve Owen to drop ends into coverage in the Umbrella Defense. Stabilizing force in the middle of the defense. Strong and smart, covered multiple gaps. Steady performer who excelled in short-yardage and goal-line situations. One of the first large tackles, out-weighing most offensive linemen. Physically became the prototype. Sometimes an inconsistent performer, but on his good days was among the best of his era and would wreak havoc on the opposition. Physical player – the perfect book end for counterpart Andy Robustelli. Penetrated the line and redirected plays back inside. Has the most defensive fumbles recovered in Giants history and the most safeties with three (the latter also an NFL record). Unofficially had a 7-sack game and 96.5 over his career. Tough, quick, aggressive, smart. Served as player/coach in 1960. Anchored the Giants great defenses that won six Eastern Conference titles and the NFL Championship in 1956. Elevated the stature of defensive players in fan consciousness with one-on-one confrontations with Jim Brown and Jim Taylor. Was the prototypical middle linebacker in Tom Landry’s intricate defense. Took full advantage of every opportunity the opposition allowed him. Powerful run stuffer. Also provided good coverage skills evidenced by 18 interceptions. Scored four return touchdowns (two interceptions and two fumbles). Excelled in pass coverage, had 18 career interceptions. Played in five Pro Bowls and was named Giants Player of the Decade of the 1970’s. Also played on special teams throughout entire career. Savvy player. A strong tackler in run support. Excelled in man-to-man coverage. Led the NFL in interceptions twice. Tied for first with most interception returns for touchdowns in Giants history, including team-record three in a single season. Had three games with three interceptions. The Giants first African-American player. Retired as the NFL’s career-leader in interceptions. Tied for first with most interception returns for touchdowns. In 1952, he had more return yardage on punts and interceptions than the NFL’s rushing leader. Incredible ball instincts, soft hands, fluid moves. Played offense as well in first two seasons. A key to the Umbrella Defense’s success. Was the only defender permitted to freelance through zones. Sure tackler. The first full-time African-American scout and assistant coach in pro football. The first African-American enshrined in the Pro Football Hall of Fame. Retired as the NFL’s all-time leader in interceptions and interception yards. Hard hitter and sure tackler despite lack of size. One of only three Giants to return interceptions for touchdowns in consecutive games. Third in Giants history in career interceptions and second in defensive fumbles recovered. Also returned punts. A stalwart of the Giants secondary. Consistently solid and occasionally spectacular performer. Second in team history with 52 career interceptions, and tied for first with 11 in a single season in 1958, which led the NFL. Fearless player and strong tackler despite lack of size. First player in NFL history to return a punt and kick for a touchdown in a game in 1955. Professional football’s first soccer-style kicker. The first player to jump from the AFL to the NFL. The Giants all-time leader in field goals, extra points, and total points scored. Solid punter who performed at his best in crucial situations. Also doubled as place kicker later in his career. Led the NFL in punting in 1958. Holds the Giants top two spots for highest punting average in post-season contests. Giants all-time leader in kickoff return yardage. One of only three Giants to return two for touchdowns. His 987 yards returned in 1964 remained a team record for 39 seasons. His 100-yard return in 1964 remains tied as the longest in franchise history. Scored 10 return touchdowns with the Giants: five punts, four interceptions, and a kickoff. Retired as the NFL’s all-time leader in punt returns and punt return yards. Second in Giants history with five punt returns for touchdowns. Was a master at faking the oncoming tackler into a move then sliding into the opening with a fluid side-step. ** Appears on team more than once. The second wave of rule changes designed to liberate the passing offense and increase scoring took place in 1978; the same season the NFL went to a 16-game schedule, added a second Wild Card team to the post-season tournament, and bolstered rosters to 45 players. The 5-yard bump rule was imposed on defensive players. Double touching of a forward pass by the offensive team became legal. Offensive linemen could now block with extended arms and open hands. The intentional grounding penalty was reduced from 15 yards to 10. Also, the Line Judge was added as the game-day seventh official. Enter the era of the frustrated defense. It did not take long for the impact of these rules to achieve their desired impact: rushing attempts fell from 58% in 1977 to 56% in 1978 to 52% in 1979 to 49% in 1980. The NFL has remained a pass-first league ever since. From 1982 through 1984, the game-day roster size increased to a high of 49 players, then dropped to 45, where it has remained. The larger rosters allowed players who were less well-rounded but more highly specialized to carve out niches for themselves on teams that valued their distinctive skill sets. At one time there was little difference between a left end and right end on offense or between a safety and a halfback on defense. Today a team will stock a roster three deep at the tight end position alone: one who is an in-line blocker, one who flexes out as a receiver, and one who moves as an H-Back. Defensively, corners are now desired by the scheme they fit (man-on-man or zone coverage), with tackling ability possibly a secondary concern. The same is true of safeties; some play close to the line of scrimmage as a hybrid linebacker, some fill in a slot corner role. Linebackers are touted as 3-down players if they have multiple skills. Some offensive backs only play on third down. Since the advent of full free agency in 1993, players have had the opportunity to select the best fit for their careers, whether it is suitable for their talent or simply financial remuneration. This current group of Giants players has won half of the franchise’s eight world championships. Some are still active and have not completed their stories. Few will spend their career with a single team, as they follow the current of the open market when they reach free agency. This is an echo from professional football’s earliest era when 60-minute players would sign game-to-game contracts as a supplementary income to their full-time jobs. Joined Giants staff as linebackers coach and defensive coordinator. 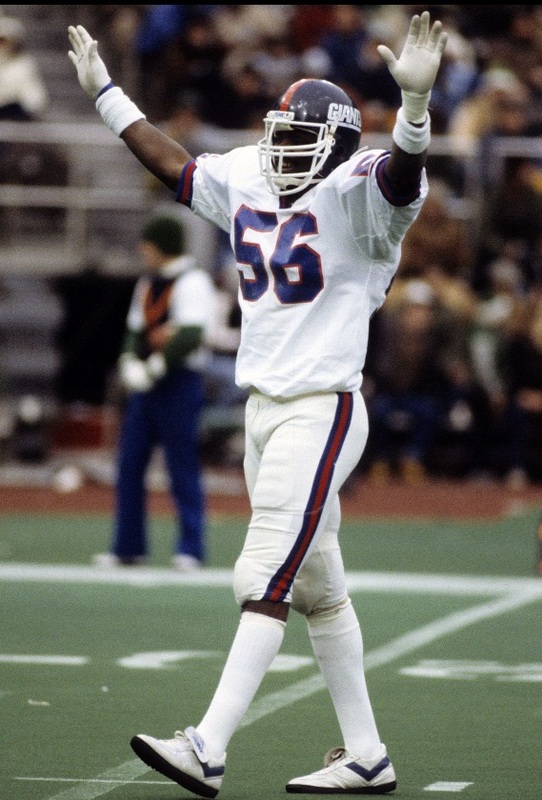 Coached Lawrence Taylor as a rookie to All-Pro status. Culminated the revival of the struggling Giants franchise with their first league title in 30 years as head coach in 1986. That team’s 14 regular-season and 17 total wins stand as franchise single-season highs. Led the Giants to another NFL title in 1990. His eight career post-season wins are tied for first in Giants history. Won three Super Bowls as member of Giants, first as receivers coach under Bill Parcells from 1988-90, then head coach in 2007 and 2011. Won at #1 and #2 NFC seeds in both post-seasons and defeated #1 AFC seed in both Super Bowls. Eight post-season wins tied for first in Giants history. Architect of versatile Giants offense that won two Super Bowls with two different quarterbacks and two different offensive lines that emphasized different blocking styles. Three times his offense was ranked in the top three for fewest turnovers. Quarterbacks coach who assumed offensive coordinator position late in 2006 season. Offense led NFL in rushing in 2008, and featured two 1,000-yard backs for only the fourth time in NFL history. The 2007 Giants were fourth in the NFL in rushing while the 2011 Giants were fifth in the NFL in passing. Three performances in the 2011 post-season rank in the top six in franchise history in terms of single-game offensive yardage output. Began his career as special teams coach under Ray Perkins. Coached linebackers under Bill Parcells and took over defensive coordinator responsibilities in 1985. The 1989 Giants were second in the NFL in points allowed and the 1990 Giants were first in that category. The Giants all-time leading receiver in catches, yards, and touchdowns for both the regular- and post-seasons. Holds the Giant regular-season record for most 100-yard receiving games. Has the second-most punt returns for touchdowns. Giants second-leading scorer in the post-season (leading non-kicker). Twenty-two 100-yard receiving games most in Giants history. Holds franchise record for most receptions in a post-season game. Had 12 touchdown catches in 2007 and caught the winning touchdown in Super Bowl XLII. Powerful, aggressive player and dominant run blocker despite battling back problems for much of his career. Appeared in 112 regular-season games with 98 starts; started in four post-season games including Super Bowl XXV. Received the Giants first ever “Franchise Player” designation in 1993. Starting left tackle in Super Bowls XLII and XLVI. Durable, started 120 consecutive games from 2003-2010. Started at all line positions except center. One of the toughest players ever to wear a Giants uniform. Earned a roster spot as an undrafted free agent in 2001. Suffered a serious leg injury in 2003, but rehabilitated and returned in 2005. Started all four post-season games in 2007. Played multiple positions. After missing the 1985 season with a knee injury, became a fixture at left guard beginning in 1987. Often played left tackle when Elliot struggled with back problems. Appeared as a reserve in Super Bowl XXI; started in Super Bowl XXV. Played in 140 regular-season games and started 11 in the post-season, including Super Bowls XXI and XXV. The Giants had a 1,000-yard rusher in eight of his nine seasons. Started 97 regular-season games and games six in the post-season, including Super Bowl XLII. One of the Giants most reliable linemen. Has started 141 regular-season games, plus 11 post-season games including Super Bowls XLII and XLVI. Primary starter all six seasons, including all three games in the 2000 post-season. Powerful run blocker. Started 105 regular-season games and 11 post-season games, including Super Bowls XLII and XLVI. Played in 135 regular-season games with 122 starts, plus six post-season games including Super Bowl XXV. Most 100-yard receiving games for a tight end in Giants history. Only Giants tight end to gain 1,000 yards in a season. Great in-line blocker. Scored go-ahead touchdown in third quarter of Super Bowl XXI. Nine 100-yards receiving games most for a tight end in franchise history. Eight 100-yard receiving games. Had a club high six 10-reception games. Holds Giants record for most receiving yards in a season with 1,536 in 2011. Seven touchdowns of 70 or more yards; second most in team history. Sixteen 100-yard receiving games third most in franchise history. Giants career rushing leader. Holds single-season records for most yards rushing, all-purpose yards, and receptions for a back. Had a club record thirty-eight 100-yard rushing games – including five 200-yard games which is tied for second most in NFL history. An excellent receiver, had three 10-reception games. Retired as Giants career-rushing leader. Holds team record for most rushing touchdowns in a game with four. Tied for the franchise record for most rushing yards in a post-season game and longest touchdown run in a post-season game. Had seventeen 100-yard rushing games and five consecutive 1,000-yard rushing seasons. Lead blocker for three different 1,000-yard rushers. In 1997, became most recent fullback to lead the Giants in rushing yards; also second on the team in receptions that season. Giants all-time leader in pass completions, passing yards, and touchdowns thrown in both the regular-season and post-season. NFL’s third all-time in consecutive games played. Has the most 300-yard passing games (38) and 400-yard passing games (4) in Giants history, plus one 500-yard passing game. His 30 games with three touchdown passes are a club record. 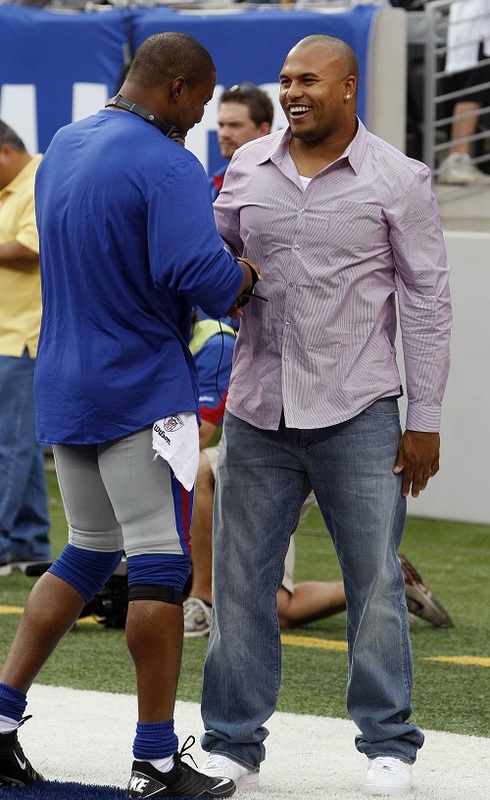 MVP of Super Bowls XLII and XLVI. Eight post-season victories are the most in franchise history. Holds the team mark with six games with 30 or more pass completions. MVP of Super Bowl XXI, his 88.0% completion percentage (22-for-25) is second all-time in NFL post-season history. Retired with all Giants passing records and most post-season victories. His 15 seasons played are tied with Mel Hein’s team record. The first Giant to pass for 4,000 yards in a season. Had 21 career 300-yard passing games, two 400-yard passing games, and his 513 yards are the franchise record for passing yards in a game. His 18 games with three touchdown passes are tied for second in team history. Set the club record with 40 pass completions in a game in 1985. Officially has the franchise’s third-most career sacks (since 1982.) Led team in sacks twice. Second most post-season sacks in Giants history. Had two sacks in Super Bowl XXI and one in Super Bowl XXV. One of only two players in franchise history to record more than one safety. Had five career three-sack games. Led or tied for the team lead in sacks six times. Holds team record with six sacks in a game. Had 5.5 sacks in the post-season. Tied an NFL record by blocking two punts in a game in 2003. Began career as strongside end in the 3-4; moved to tackle in the 4-3 and started at both interior positions. Was stout against the run but also provided interior pocket pressure. Led the Giants in sacks three times. Compiled 63 sacks and 14 fumble recoveries during his career and also registered a safety. Anchored a 3-4 line. Had two sacks in the 1985 Wild Card Playoff. Tough player who battled chronic back issues most of his career. Led Giants down linemen in tackles in 1984 and 1986. Forced Roger Craig fumble in waning moments of 1990 NFC Championship Game. 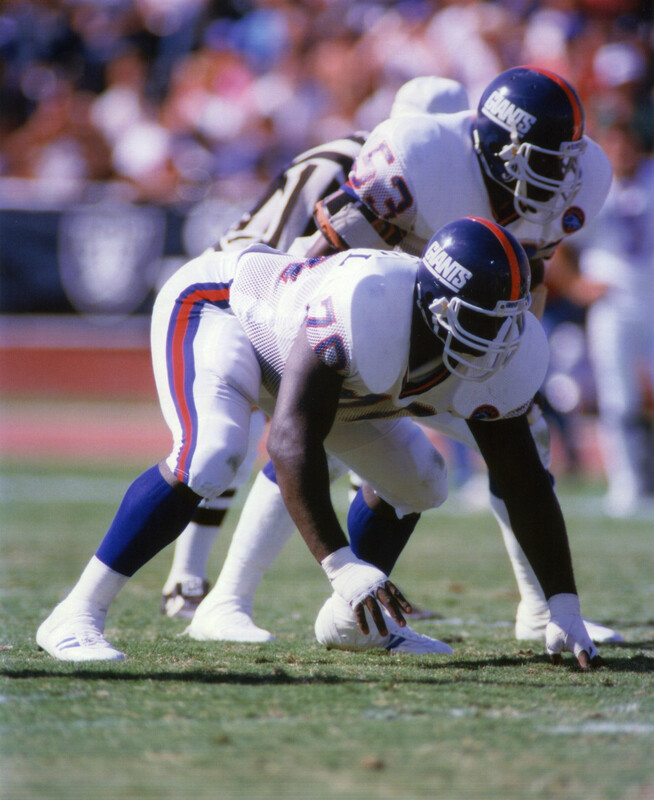 Led Giants down linemen in tackles in the 1989 and 1990 regular-seasons and had the most tackles in the 1990 post-season. His 15 seasons played matched Mel Hein and Phil Simms franchise record. Most games played as a Giant. Has the fifth-most sacks in NFL history, most in a single season, and second-most in Giants history (unofficially). Held the edge against the run as well as he rushed the passer. Led the NFL in sacks twice and the Giants seven times. Had seven games with at least three sacks. Most post-season sacks in Giants history. Retired with the most touchdowns scored as a defensive lineman in NFL history. Unofficially has 96 career sacks. Also caught a touchdown pass as a tight end. Scored a safety in Super Bowl XXI. Had 60.5 sacks in the regular season and 5.5 in the post season. Two sacks each in super Bowls XLII and XLVI with a forced fumble and forced safety. A strong two-way defender who held the edge against the run while totaling four seasons with double-digit sack totals. Led the Giants in tackles in 1986 and 1987. Had two 10-tackle games in the 1986 post-season, including Super Bowl XXI. Led the defense with seven forced fumbles in 1989. Excellent in coverage, led Giants in passes defensed in 1991. Led the Giants in tackles in 1990. Played a critical role in Bill Belichick’s “Big Nickel” defense in Super Bowl XXV – was on the field almost every snap. Had 14 tackles in the 1990 post-season while also playing special teams. Led the defense in tackles 1990-1992. Set a then-team record with 4.5 sacks in a game in 1992. Returned interceptions for touchdowns in 1988 and 1989. Excellent in pass coverage. Had 30-yard rush on 4th quarter fake punt in 1990 NFC Championship Game. Led the Giants in fumble recoveries in 1990 and led the defense with six tackles in Super Bowl XXV. Intercepted 10 passes and recovered nine fumbles during his career. Was a 13-year starter and 9-time Pro Bowler at two positions: middle linebacker in the 4-3 and inside linebacker in the 3-4. Had 20 solo tackles in a 1982 game vs Green Bay. Stout run defender who also intercepted 11 passes and recorded 17 sacks. Returned an interception for a touchdown in the 1984 NFC Divisional playoffs. The most decorated player in Giants history. Retired with the second-most sacks in NFL history. Revolutionized the way outside linebacker is played. One of the most disruptive defensive players in NFL history. Had 12 games with at least three sacks. Played in the most post-season contests in franchise history. Made the Giants as a special teams player and became a five-time Pro Bowl linebacker. Led the team in tackles three consecutive seasons 1996-1998; led the Giants in sacks in 1999. Led the Giants in interceptions twice. Led secondary in tackles in 1991. Sure tackler, strong in run support. Intercepted pass in overtime of 2007 NFC Championship Game to set up game-winning field goal. Defensed desperation pass to preserve win in Super Bowl XLII. Recovered a fumble for a touchdown in the 1981 Wild Card Playoff at Philadelphia. Led the Giants with seven interceptions in 1984. Tied with most interceptions returned for touchdowns in Giants history. Also returned an onsides kickoff for a touchdown. Led Giants in interceptions three times and has the most post-season interceptions in team history. A versatile playmaker who has played both safety positions and also slot corner. Led the Giants in tackles in 2011. His six interceptions in 2013 were a team high. One of only four Giants to record three interceptions in a game. A hard hitter and exceptional tackler. Led the Giants secondary in tackles in 1984 and 1985 and interceptions in 1986 and 1989. Scored touchdowns on two interception returns. Strong run defender who made a lot of tackles. Led the defense in interceptions in 1992 and 1993, totaling 14 during his career. Played in two Pro Bowls as a specialist. Has served as special teams captain three seasons and is often among the team leaders in special teams tackles. Second all-time leading scorer in Giants history. Only player in NFL history to successfully make two overtime field goals in the post-season. Kicked field goals in 26 consecutive games, a team record. Giants all-time leading scorer in the post-season. Successfully converted five field goals of 50 yards or more, third-most in team history. His 83.6% field goal conversion rate is the highest for all Giants kickers with at least 100 attempts. Led the NFL in punting in 1990. Second highest punting average in franchise history. Led the NFL in punting in 1979 and ’80. Holds the record for most punts in team history. Has the second-most kick return yards in Giants history. His kickoff return touchdown in 1992 was the Giants first in 20 seasons. More than just a great returner, was also the Giants third-down back. Set a then-team record with 1,807 all-purpose yards in 1989. Led the Giants in all-purpose yards four times. Threw three touchdown passes on the halfback option. Was the Giants leading receiver in 1990. Returned a team-record six punts for touchdowns. Has the Giants most career punt return yards. Led the NFL in punt return yards in 1989 and 1990. *A note on the All-Pro designations. Since the beginning of organized professional football in 1920, various media outlets created their own lists of All-Pro teams, using their own criteria. For the sake of simplicity and consistency we have chosen to use Pro-Football-Reference.com as our singular source. 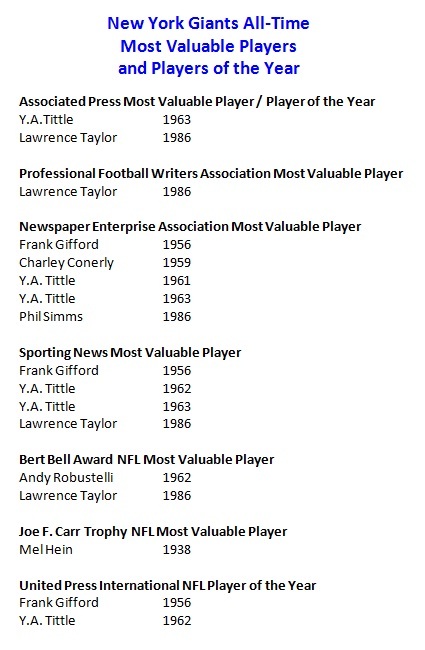 They acknowledge First-Team All-Pro selections from The Green Bay Press-Gazette 1925-1930, United Press International from 1931-39, and The Associated Press from 1940 through the present.